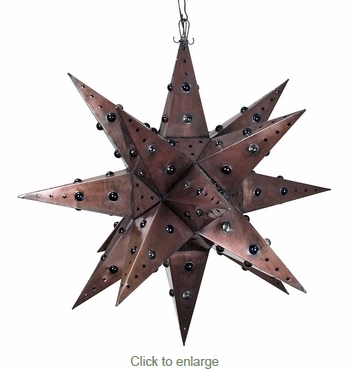 This giant aged tin hanging star light fixture will make a grand statement in your entryway, dining room or living room. Featuring punched star designs and colored glass marbles, this extra large star light will make a beautiful display of light with southwest charm anywhere you hang it. These punched tin star lights are all handcrafted by talented Mexican metal craft artists. Color and finish may vary slightly from what's pictured here. Chain and ceiling plates sold separately. $9.95 Large Tin Ceiling Plate 6" Dia.